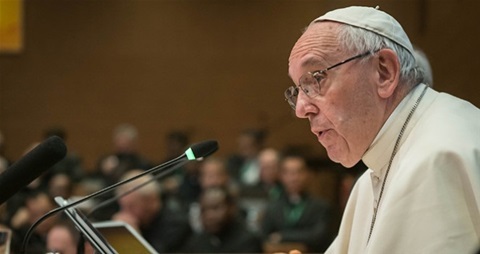 This is a good article that refutes papal claims that Amoris Laetitia is based on the natural law, is Thomistic and, that it is harmonious with the doctrine presented by JPII in Veritatis Splendour (i.e., that the object is the source of morality). A key passage is “Aquinas, on the other hand, gives great prominence to rules and laws as well as to virtues. And some of those rules or moral norms prospectively exclude certain acts as always wrong by virtue of their object and regardless of personal intentions or extenuating circumstances.” You will also find this teaching in the catechism. In a formal address delivered during his recent visit to Colombia, Pope Francis implored his brother Jesuits to defend his embattled exhortation on marriage, which remains haunted by its obscurities and fervent vagueness. In his short discourse, the pope also enlisted Thomas Aquinas in this enterprise by insisting upon the Thomistic properties of Amoris Laetitia. He described how “the moral theology of Amoris Laetitiais Thomist, the morality of the great Thomas.” He juxtaposed this morality to the more rigid moral theology based on casuistry. And in a rather harsh tone he accused those who critiqued his exhortation of having a “purely casuistic” approach to moral reasoning. However, there is little in Amoris Laetitia that invites a comparison with Thomas Aquinas. There are some quotes from Aquinas, but several references taken out of context do not warrant categorizing the pope’s writing as Thomistically inspired. St. Thomas Aquinas’s moral philosophy is based on the natural law which is mentioned in passing only once in the entire exhortation. Furthermore, Amoris Laetitia does not build on the insights of John Paul II’s Veritas Splendor, which is thoroughly Thomistic. That encyclical is never mentioned in Pope Francis’s long document. In fact, liberal theologians have cheered Amoris Laetitia precisely because it dismisses the natural law in favor of a more “pastoral” approach to moral issues. Michael Shawn Winters of the National Catholic Reporter notes with approbation that Amoris Laetitia represents a major shift from the natural law reasoning favoured by Aquinas and by John Paul II in their treatment of sexual morality. The reflections of Archbishop Fernandez, who is considered the ghost writer of Amoris Laetitia, also fail to affirm the affinity between Amoris Laetitia and the writings of St. Thomas Aquinas. In an article called “Chapter VIII of Amoris Laetitia: What is Left after the Storm,” Archbishop Fernandez actually demonstrates the asymmetry between this work and Thomistic morality. According to Fernandez, the pope agrees with Aquinas’s about the importance of general moral norms. However, according to Amoris Laetitia “in their formulation they cannot provide absolutely for all particular situations” (304). Archbishop Fernandez offers this explanation: “The absolute norm in itself does not admit of exceptions, but that does not imply that its succinct formulation must be applied in every sense and without nuances in all situations.” He provides this example to illustrate his argument: the divine and natural law “Thou shalt not kill” does not admit exceptions but what is included in the term “killing?” Is killing in self-defense prohibited by this norm? No one would question, says Fernandez, the validity of inquiring whether or not killing in self-defense falls within the narrow compass of the negative precept “Thou shalt not kill.” Thus, there are absolute moral norms but we cannot formulate them properly to include all violations of that norm and therefore exceptions must be allowed. The same holds true for the simple moral norm that forbids adultery. According to Fernandez, it is perfectly valid to ask if all “acts a more uxoriocohabitation” should always fall within the negative precept that forbids adulterous behavior.